It had been a terrible few days in Burnley with the shocking news of the murder of 73-year-old Kenneth Howard of Mizpah Street, right in the shadow of Turf Moor. The police investigation was underway but they believed Mr Howard had been disturbed by intruders and was dealt several blows about the head with a weapon. He died of a heart attack either during or shortly after the attack. Mr Howard had been a former president of the Burnley Ramblers' Association and Det. Supt. Hacking of Burnley police said: "We have heard that he was left a large amount of money some years ago but are still trying to ascertain what he had, how much, and what was stolen." He warned of the potential for further burglaries in the area. It wasn't the only big crime for the local police. In town, a safe was stolen during a raid on the Leeds Permanent Building Society. A crowbar was used to rip it from the floor. It contained 100 blank cheques and a substantial amount of cash thought to be around £18,000 in used £20, £10 and £5 notes. A lady, who wished to remain anonymous, because she was frightened to death, claimed she was responsible for the recent problems in Daneshouse, those where a gang of white teenagers had attacked a group of Asians who were playing football. She said it was all caused by a group of white bigots who didn't much like her music or her friends. She told the Burnley Express: "I am white but I have a lot of Asian friends and that really seems to have riled some people round here. "A lot of people are saying that the Asians are causing the trouble when, in fact, it all started after an argument over my stereo being played too loud." There were more problems in Cliviger with the water. Fines had recently been issued after water turned black because of a discharge of coal dust from a mine which had contaminated the water from a stream. It had got worse, the water had turned red and was now being described as the tomato soup river. Fear not though, the newly established National Rivers Authority were on their way to appraise the situation. If it could not be resolved it was thought that they could perhaps sell the water to Heinz. A few weeks ago we reported about Kevin and Vera. They'd fallen in love through letters, met, got married in days and then got caught up in red tape. Before your imagination runs wild, the tape was bureaucracy due to Vera being from Leningrad. The poor lady had been deported back home. Now we have news of another Burnley couple Harold and Winifred who were visiting Moscow and Leningrad. Although there's no evidence to suggest they'd gone looking for Vera, they did get more than they bargained for. They'd only gone sightseeing and they took in the world renowned Moscow State Ballet whilst also visiting the Kremlin before moving on to Leningrad where they got caught up in the coup. They couldn't even get back to Moscow as roads were closed off with one local telling Harold: "Please tell your people when you get home. We've had 70 years of this and people have suffered enough." All Harold could say on his return that he will always recall their surplus of tomatoes - maybe he should have brought some back for the Cliviger river. Burnley's 'Year of Sport' was launched as children, dressed as sportsmen and women, walked from the Thompson Centre to the Town Hall. Meanwhile, their dads might just have called in for a haircut and free extras. In days gone by men were asked if they wanted anything for the weekend by the barber, but at Jazzman Grooves on Bull Street they were celebrating their first birthday by handing out free beer with each haircut. The local cinema (Brierfield was the closest with Hollywood Park still almost six years away) was showing Robin Hood, Prince of Thieves, but the Mechanics in Manchester Road were hosting comedian and former Doncaster Rovers defender Charlie Williams for two nights. I bet he was good me old flower. Burnley were doing well in the Fourth Division. A defeat at Rotherham on the opening day of the season had been followed by three wins and a draw with only Crewe with more points. Saturday 14th September 1991, however, was not a good day for those Clarets who made their way to Edgar Street to see us play Hereford United. Just 11 months earlier, we'd suffered a horrible 3-0 defeat there and ahead of this encounter manager Frank Casper said: "We lost at Hereford last season because we weren't tight enough at the back. "This season we are getting to grips with things better at the back and if we play to our full potential I am sure that we can get the right result. There is an excellent team spirit and we have already settled one score from last season by beating Doncaster Rovers at Belle Vue. "This season we are going to Hereford with a bit of a run under our belts and I am sure they will find us harder to handle than they did last year." Burnley suffered a blow ahead of kick off with influential midfielder John Deary declared unfit because of a back muscle injury. The better news was that both Mike Conroy and Roger Eli were passed fit after suffering niggly injuries whilst Joe Jakub was back in contention after recovering from the injury sustained in the Rumbelows Cup game at Wigan. Andy Farrell came in for Deary with Jakub taking his place on the bench in a game that was described by Edward Lee in the Burnley Express as another nightmare on Edgar Street. 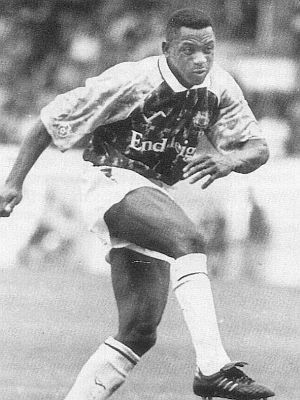 He reported that we'd only ourselves to blame for the defeat in 1990 but this time the fates were stacked against us. "David Hamilton had one of those days ..." was the headline a week earlier and it was proving to be one of those seasons for him. Having been so unfortunate to be sent off in the draw against Crewe he lasted just 15 minutes here before having to be helped from the field with a back injury. That meant Farrell had to move to right back with Jakub coming on to partner Mark Yates in the centre of midfield. If that wasn't bad enough, only nine minutes later Burnley were down to ten men when John Francis was sent off in near farcical circumstances. There was an incident off the ball that left Francis down injured and whilst he was receiving treatment he was told by referee Peter Jones that he was going to be sent off. Jones later confirmed that he'd been sent off for elbowing Hereford's Mel Pejic but after the game both Francis and Pejic confirmed it hadn't happened. Prior to that, it had been a terrific start to the game between two in form teams. Hereford came close in the very first minute, only to be denied by Andy Marriott, but Burnley were just about the better of the two sides. That changed with the Francis incident and within three minutes the Clarets found themselves a goal down as well as being a man down. A Simon Brain shot was saved by Marriott but the rebound fell kindly for LOWNDES who made no mistake. By half time we were thankful for the goalkeeping of Marriott who subsequently made three good saves to keep the score at 1-0 at the interval, after which Burnley switched to a flat back four . Eli almost brought us level with an early chance but on 56 minutes the game was taken beyond Burnley when Hereford doubled their lead. Mark Monington carelessly lost possession of the ball just outside his own box. That enabled Brain to cross the ball for HERITAGE to score. Hereford settle for that in what then became a tedious second half although Burnley should have had the clearest of penalties right at the end of the game only for Jones to incredibly award a free kick for handball outside the box. The defeat saw Burnley drop from second to eighth in the table. There was a full fixture list to come in midweek but with Burnley sitting it out due to there being an odd number of clubs in the division. Casper was fuming at the end as, for the second game in a row, he saw his team forced to play with ten men. "I don't condone any retaliation whatsoever, but I think that referees and linesmen are sometimes looking for the wrong thing. "Their player went over the top of the ball and got Francis, but Francis got sent off for elbowing their man and that was something only the linesman knew anything about. "Every week referees and linesmen are looking for things that are not there and missing obvious fouls and 'over-the-top' tackles. They seem to be looking for piddling little things that are not important. "We are disappointed with certain decisions of officials, but that is becoming a regular thing." Speaking about the performance, Casper added: "I thought we stuck to our task very well after being reduced to ten men, but their second goal knocked the stuffing out of us. It was a sloppy goal to concede and that's twice in as many games that we have given away a sloppy goal. "It did not help that we had to change formation twice but I still think we could have come away with something from the match. We had started very well and were right in the game, but we then suffered two bad blows and it was going to be uphill all the way from there." 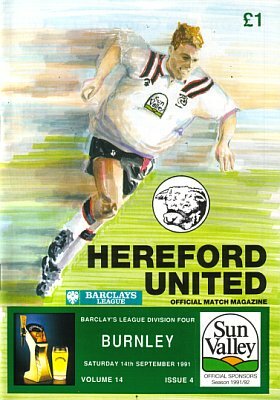 Hereford United: Tony Elliott, Chris Fry, Greg Downs, Andy Theodosiou, Steve Devine, Steve Lowndes, Derek Hall, Mel Pejic, Simon Brain, Peter Heritage, Jon Narbett. Subs not used: David Titterton, Henry Caffrey. Burnley: Andy Marriott, David Hamilton (Joe Jakub 15), Steve Harper, Steve Davis, John Pender, Mark Monington, Roger Eli, Mark Yates, John Francis, Mike Conroy, Andy Farrell. Sub not used: Ian Bray. The result had lifted Hereford into second place, amongst a cluster of four clubs on 13 points with Rotherham United now in first place. Previous leaders Crewe Alexandra lost for the first time as did Northampton Town. There was better news for both Maidstone United and Wrexham who both recorded their first wins. Maidstone's took them off the bottom of the league with Scarborough, now the only side without a win, down in that bottom place.